After a wet and chilly spring, the sun shone on the track at Falmouth High School where Falmouth welcomed Biddeford, Massabesic, Portland and South Portland High Schools for a Southwestern Maine Activities Association (SMAA) meet on May Day. The host Yachtsmen prevailed in both the girls and boys meets; both meets were closely contested with the Falmouth Boys team edging the Biddeford Tigers by 4 points (107-104), and the girls from Falmouth besting South Portland by an even slimmer margin (121-118.33). In the boys meet Falmouth and Biddeford were followed by Massabesic (82.5), South Portland (70.5), and Portland (33). The Massabesic girls also took third (70.66), with Biddeford (49) and Portland (35) closing the scoring. 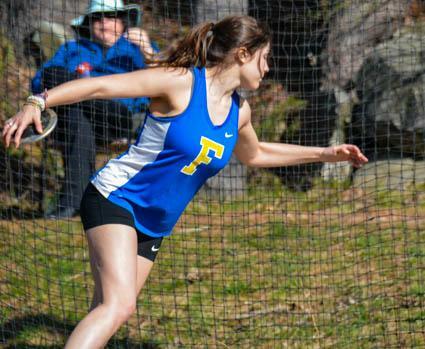 It was an auspicious start for Falmouth girls as junior Emma Harrington's second throw of 112-03 won the discus; Harrington bested her prior top mark of 105 which had netted her a 4th place ribbon at the 2017 State Championship. Harrington also had the fifth best shot-put result. But overall girl's throwing was dominated by South Portland as Rebekah Hunnewell-Dunphe claimed the top spot in both the shot put and javelin while taking 4th in the discus; the sophomore put up new personal bests in each of the three events. Hunnewell-Dunphe had support from Mary Disanto who place in all three throws while Fiona Stawarz closed the throwing scores for the Red Riots with a 4th spot in the javelin. Caroline Lerch from across the bridge in Portland also placed well as she took second on both the shot put and discus. Falmouth's dominance in the sprints enabled the Yachtsmen to build the lead necessary to hold off the South Portland girls. 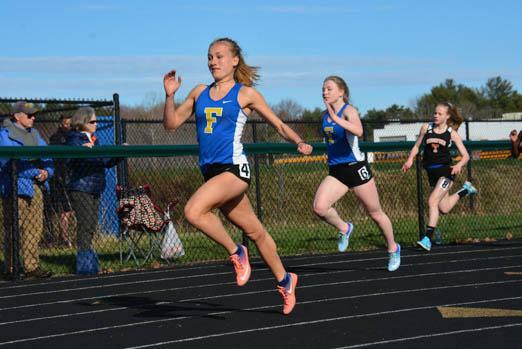 With more than a dozen entrants in the 100 and 200, Falmouth, led by Sophie Marcotte, took four of the top five spots in both races. With these two races the Yachtsmen collected 38 of 42 possible points and accounted for nearly a third of their point total on the day. Unsurprisingly, Falmouth's 4 x 100 team, anchored by Marcotte, far out-paced runners-up South Portland. Marcotte added a second place finish in the long jump. Falmouth also took first place in the 4 X 800 relay as the team anchored by Karley Piers came in at 11:48. Piers closed out the day by taking the top spot in the 3200 covering the same distance by herself in 11:42. Kylie Johnson of Massabesic finished second in the 3200, as the junior placed in four different events for the Mustangs. Johnson, presented an uncommon profile for the day as she placed in the 100, 4 x 400, 800 and 3200. She was on the podium for the 800 at both the Indoor Championship in February, and the 2017 Outdoor Championship. At this meet however, Falmouth's Malaika Pasch took the top position in the 800 running 2:19.84. 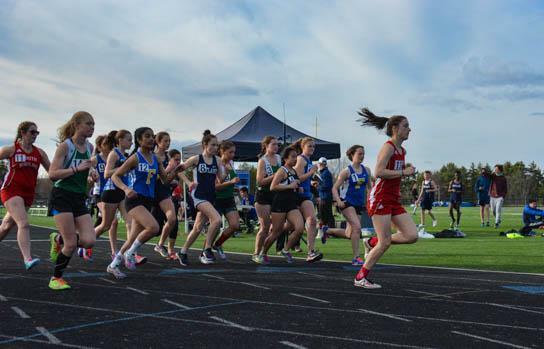 Senior Julianna Selser, running in her first 1600 of the season and thus without a seed time, started the race in the far outside lanes wearing 13 on her hip but moved to establish a quick lead. It had grown to more than 100 meters by the halfway mark; the senior, bound for UMass-Lowell in the fall, finished with a margin of more than three-quarters of minute at 5:33. Even so, Falmouth collected points as they took second and third. South Portland cleaned-up the 1600 meter race-walk taking the top four spots and 20 of available 21 points. Finishing first at 9:40.53 was Madison Smith. 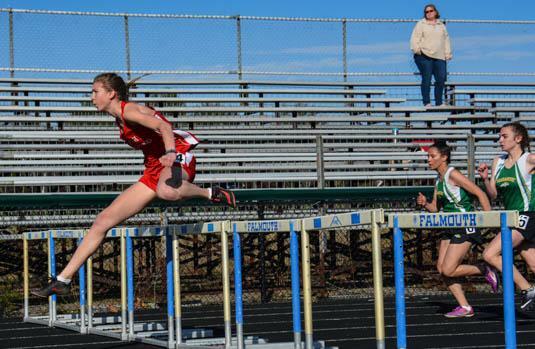 Kaleisha Towle was a quadruple winner for South Portland taking both the 100 and 300 hurdles, along with the long jump. Towle also took the first leg for the Riot's winning 4 x 400 team. The sophomore collected ribbons in the 2017 State meet in both the 100 MH and the long jump; her day's Tuesday work gave her automatic qualifiers for this year's state meet in all three events. Bekah Robertson of Biddeford took three individual wins-the pole vault, high jump, and triple jumps-to go with a fourth place finish in the 200. Robertson set new personal marks in all three events. Her new outdoor mark of 9-0 matches the 9-0 vault that got her third place in the 2017 Indoor Championship. Her best indoor mark to date is 9-6. Keira Galbreath claimed the 400 win for Massabesic while Sierra New place 2nd in both hurdles and collected points in the long jump. Jaidyn Appel placed in the high, long, and triple jumps for Portland. On the boys side, the early season weather postponements showed in the seeds. With Portland not having had a meet yet this season and some teams only having competed only in South Portland's Vacation Invitational where family travel can impact participation, the "slow" heats were populated almost exclusively by Portland Bulldogs. Even so Portland did manage to pull of some strong performances with first year Nate Fogg running a 12.11 100 meters in the 7th heat to take the fifth spot overall. Similarly Joe Harrington, running in the slower race of the 1600, was forced to run more or less alone, but still finished in 4:51 to take the 4th spot overall; Harrington also took 4th in 3200. But just as in the girls meet, Falmouth showed great depth taking the top three spots in 1600 with Ben Greene and Charlie Henning following John Auer who had blazed to first place in 4:25.54. It was a new PR for the junior who took the 6th podium position in the 2017 Outdoor Championship meet. Auer also took a leg in Falmouth's winning 4 x 4 team. 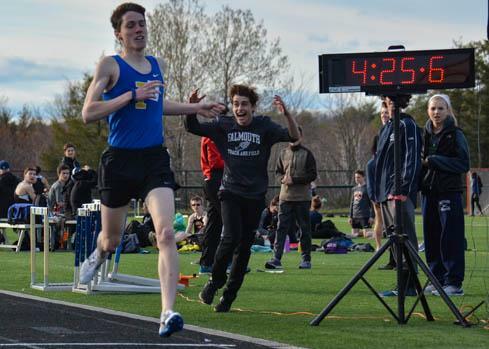 Connor Piers and Benjamin Potter gave Falmouth a similar one-two punch in the 3200 as Piers finished in 10:18.10. Piers, who with Auer led Falmouth to the 2017 Class A Cross Country title, also helped the Falmouth 4 x 800 team to a second place finish. Falmouth claimed both the 4 x 100 and 4 x 400 titles. Another Yachtsmen, Alvaro Fuentes, took the 200 win at 23:37. Fuentes also had parts of the 4 x 100 and 4 x 400 wins. Fuentes was on podium at State Indoor in February for the 200 and , this outdoor time qualifies him for State meet in June at Morse High School in Bath. Likewise Douglas Cooke's 400 win qualifies him for states. Cooke also took 2nd in the high jump and was part of the winning 4 x 400 team. The Biddeford Tigers brought a one-two punch to the 110 meter hurdles, led by Scott Berry with a 16.69 state AQ. Teammate Jack Delprete claimed victory 300 hurdles to go with fellow Tiger Kyle Norton's high jump win; Norton also took 2nd in the long jump and placed in triple. Ben Drummey's Pole Vault of 12-06, won the meet and set a new outdoor PR; he had achieved same height indoors at the February State meet and was rewarded with a 5th place ribbon. 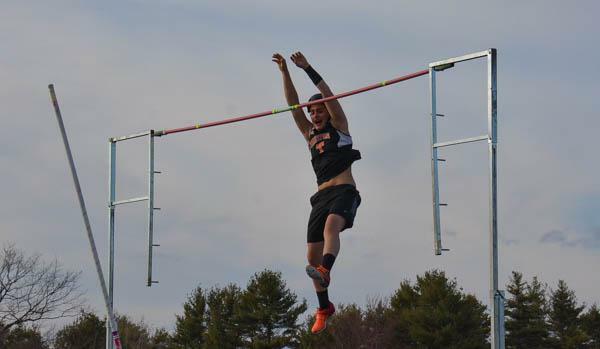 Cody Saucier Biddeford won the javelin, took 2nd in discus, and 4th in shot put. Another top finish for South Portland came from Clifford Robbins-Sennewa in Race-Walk (8:39.42)), he also took fifth in 3200. Teammate Joseph Emery took 1st in the long jump to go with a 2nd in 300 hurdles. Massabesic's Matthew Pooler won twice in 800 and in the triple jump. The Mustangs did well in the 800 as they also galloped to the 4th and 5th spots. 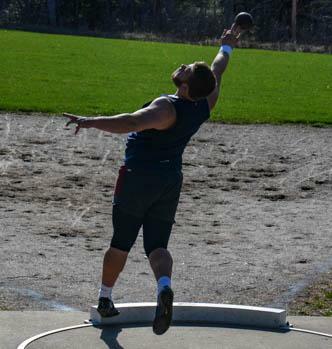 A final bright spot for Portland was thrower Keller Nicolai who won the shot with a heave of 50-11.75, a new personal best, and also claimed the top spot in the discus. The Yachtsmen host again this weekend when boarding schools Exeter, Pingree and Hebron visit the leafy Falmouth campus, Saturday, May 5th.